Are you wondering how to choose your ideal Quartet and how best to use them to enhance your Wedding Day? Let us give you some ideas from our years of experience at this amazing venue. There are three primary considerations, the music You like, the Ceremony, the Reception. Quartet repertoire can be divided into Traditional, Light and Modern. Not all Quartets play all styles, so you need to think about what you are expecting of them and have a look at their Repertoire Lists (which are only indicative, their full repertoires are usually much bigger). Is your Ceremony a Civil Ceremony at Eastnor Castle, or is it at St John The Baptist in Eastnor village or another local church? How the Ceremony can be Choreographed depends on whether you book a String Quartet (2 violins, viola, cello) such as ref: 6488 or a Flute & String Quartet (Flute, violin, viola, cello) such as ref: 2001.2 . Your choice has also to take into consideration whether you want Pop Covers, and the sound that you like best, as the two quartets are different in both respects. Flute & String Quartet such as ref: 2001.2 : With this option, it is normal for the flautist to play a solo flute piece as Bride and Bridesmaids descend the stairs, then lead couple and guests across the Great Hall to Clarke's Trumpet Voluntary. 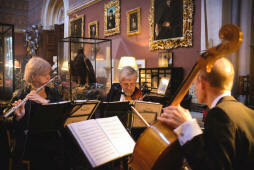 As the couple enter the Gothic Room, the other three members of the quartet, who are already in the in the room, join in and the Quartet play until guest are seated. String Quartet such as ref: 6488 : With this option, the entire quartet are located at the bottom of the stairs and play as Bride and Bridesmaids descend the stairs and continue playing as the couple lead their guests across the Great Hall into the Gothic Room, after which the quartet relocate to the Gothic Room as guests are seating themselves. Either quartet option play during the signing of the register and for the Recessional. After the Ceremony, the Quartet relocates to the Octagon Room, Great Hall or Veranda, as appropriate and play until the Wedding Breakfast is served. 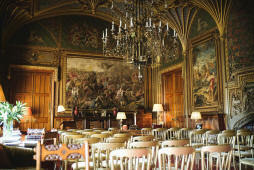 Although at many venues the Quartet may play during the meal, Eastnor Castle's layout does not easily lend itself to this. 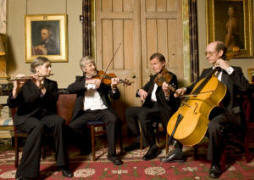 If it is something that you think you would like, discuss it with the staff at the Castle for their judgement on whether the location of the meal (Dining Room, Great Hall etc) and number of guests will be appropriate to have the quartet playing. They have a lot of experience and will guide you wisely. The leader of the Quartet will be happy to discuss the details of your wedding day after you have booked them and suggest suitable pieces of music for the ceremony if you wish. Much of Pop and Film music is not published in Quartet arrangements, if at all. If there are 'Must Have' pieces of music, let us know when you send your enquiry. 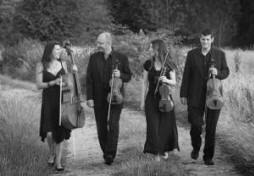 The quartet may have them in their repertoire, but if not may be able to get hold of the music for you. Only some quartets will do arrangements specially for you, such as Quartet ref: 6488. But, not all pop and film music is suitable for being played by a quartet, and if this is the case, we will tell you. Also, just because you may have seen a Youtube clip of a quartet like the Vitamine String Quartet (based in Los Angeles), perhaps performing with rhythm backing etc, doesn't mean that the music is published and that it can be performed outside a studio setting.